So much yarn, so little time. 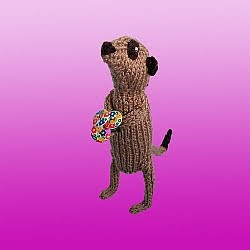 : Valentine Meerkat Winner! Thank you to everyone who signed up for my newsletter, I hope you're all going to enjoy hearing about new meerkats once in while! I have used random.org and picked a winning number, and am waiting to hear from the 61st person who signed up so that I know where to send their meerkat. Sorry to disappoint everyone else, but don't forget that right up until Valentines Day each "undressed" meerkat will bring you flowers! I want A MEERKAT!!! NOT FAIR!